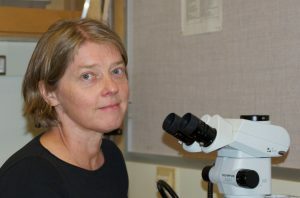 Teresa E. Pawlowska is a faculty member in the School of Integrative Plant Science at Cornell University, where she teaches Mycology and Plant Behavior & Biotic Interactions. Her research interests are ecology and evolution of symbiotic associations, with the current focus on interactions between fungi and bacteria. Findings of her research group have been published in Mycologia, PNAS, Nature Communications, Molecular Biology & Evolution, and ISME Journal, among others. Teresa received an MS degree in Environmental Biology from the Jagiellonian University in Krakow, Poland, and aPhD in Plant Biological Sciences from the University of Minnesota, where she studied biology of arbuscular mycorrhizal fungi with Ris Charvat. She worked as a postdoc with John Taylor at the University of California, where she elucidated the genetic makeup of arbuscular mycorrhizal fungi. She joined MSA in 1994 and received the Alexopoulos Prize in 2007. From 2008 to 2013, she served on the MSA Research Awards Committee. At Cornell University, she directs the NSF-funded Research Experience for Undergraduates Program Microbial Friends & Foes.